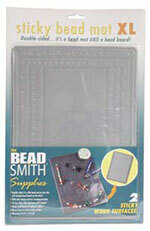 Create a comfortable work space on any table or tray and prevent your beads from rolling away! Super-soft, foam-like material is ideal when working with small beads. Package of 3 washable bead mats. Mats are 11 x 14 inches. Tools and supplies shown are for illustration only and are not included. 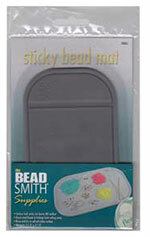 Create a comfortable work space on any table or tray and prevent your beads from rolling away! 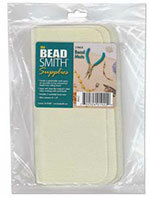 Super-soft, foam-like material is ideal when working with small beads. Package of 2 washable bead mats. Mats are 8 x 8 inches. A clever way to organize beads while you work. Pick up, sort, and pour beads. 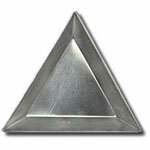 The triangle shape and angled edges allow you use these trays as little bead scoops to chase down errant beads. Sort your beads into different trays while you're working. 12 trays per package. Made in India. Great for keeping your beads from rolling away. The surface feels sticky but leaves no residue! Rinse and dry to refresh sticky surface. Measures 3¼ x 5½ inches.